WOW - HOW AWESOME IS THIS - HOT - HOT - HOT - 5 APPS IN 1! * Insert smiles in any other text app including Facebook or Twitter. * Endless possibilities symbols, vehicles, sports, people, music, smileys, animals, frames, emoticons and many more! 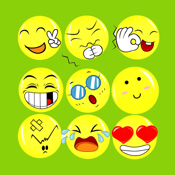 * Tons of entertaining, crazy, adorable, witty, humorous and lovable animated Emoticons. * Express your-self with exciting Emoji art! We’ve now added Emoticon Photo Collage Maker. iPod users: Custom Emotion Clip Art can be used for everything (email, notes etc) except SMS text messaging. Emoji 2 Art ALSO comes with 1200+ Custom Emotion Clip Art that you can share with your friends over text messages, facebook, twitter and emails. * Easily Decorate your Text Messages and Emails with over 1200+ Custom made Emotion clip arts. * Email, text and send over 975 custom Emotion themed clip art: Thanksgiving, Halloween, Christmas, New Years and many more! Check it out now for FREE!